Regardless, all ALEs are required to file these forms with the IRS and provide statements to full-time employees about health coverage, even if the employers are not required to offer affordable coverage that meets minimum essential coverage or value in 2015. Information reporting is voluntary for 2014, but all ALEs must submit the forms in early 2016 for calendar year 2015. It is anticipated that the IRS will release the 2015 version of the forms by the end of this year. If you are a Paycom client, the submission and distribution of these mandatory forms can be done easily through the ACA Dashboard. 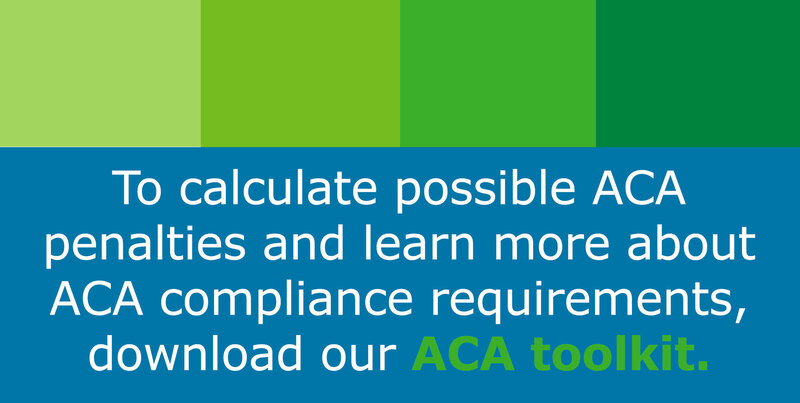 Paycom’s ACA Dashboard streamlines reporting requirements as users can analyze their information to ensure they are in compliance with the new federal guidelines. In addition, the ACA Dashboard can be autopopulated with an employer’s existing data, and this data also can be autopopulated into the required IRS forms. The ACA Dashboard is provided free of charge to all clients; filing of the forms for 2015 can be done on your behalf for a small fee.